Grammy's Attic: OMG, Cats ! I'm reminded of a childhood friend I met at summer camp and we became best buddies in the way kids do. We promised to write to each other all the time but, unlike most kid promises, we actually did. Our friendship lasted into and beyond college. When I was getting married, she traveled more than 300 miles to attend and stayed at my house. It turns out she was traveling with her beloved macaw, a large kind of parrot, because after the wedding she was moving to San Diego for graduate school. I didn't mind in the least but her bird went a little nuts when he discovered my two cats! 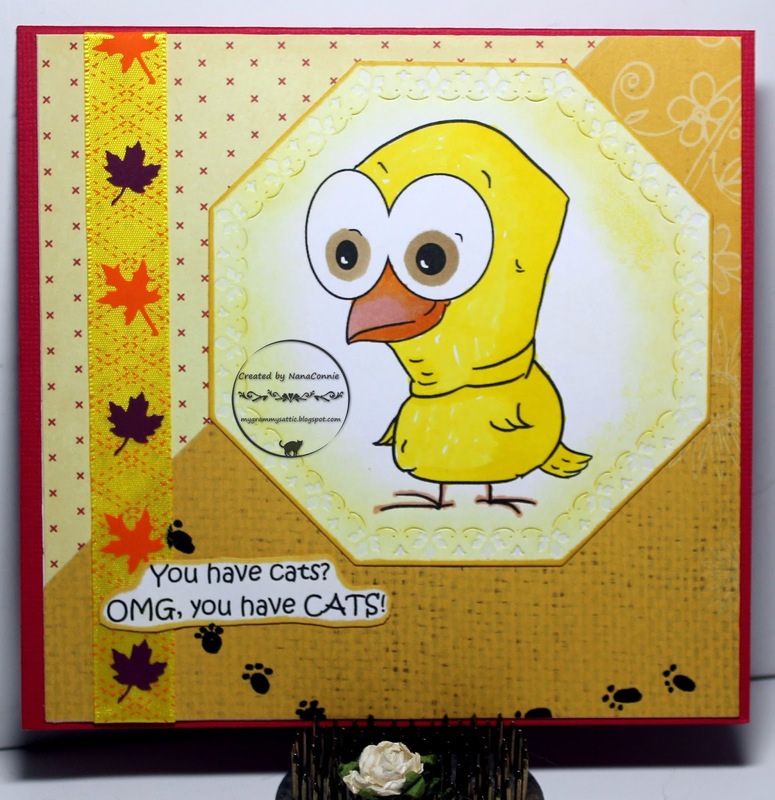 Colored with water colors & die cut with a die from Spellbinders. Papers are from my stash of scraps and the ribbon had the perfect colors. This is fabulous and loved to read your story about your friends macaw. I hope you are well my friend. I just love your humour, and what a story, I did laugh, but how lovely you stayed friends so long. I LOVE your card, gotta get mine done. Lol!!! So cute! Thank you so much for sharing this with us at Creative Inspirations. Good luck! How cute this is, Connie! LOVE it. That little birdie is the sweetest. Thanks so much for sharing with us. It's always so nice to have you play along with us. www.karen-mycuprunnethover.blogspot.com - I hope you will stop by to visit me! Jeepers! Creepers! Where did you get those eyes! What an adorable image! Thanks for sharing with us at the Scrapy Land Challenge! Blame It on the Cat Nap !